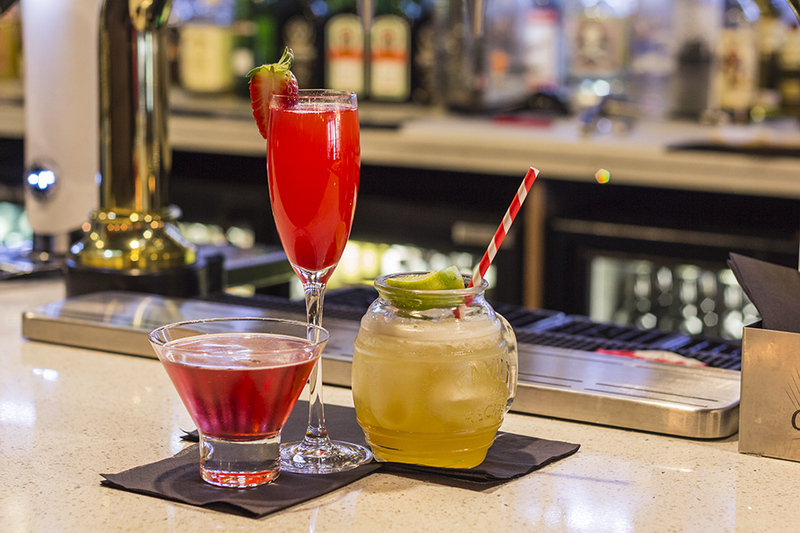 Get your weekend off to a good start with two cocktails for just £10! Available Sunday - Fridays between 5-8pm. Choice available from classic cocktail menu, both cocktails must be the same! Book online for free text confirmation or call 01332 809 899. Indulge in delicious desserts for just £4.90! Book online for free text confirmation or call 01332 809 899. Enjoy a delicious sharing platter for just £13! The platter includes Chipolatas, garlic mushrooms (v), tomato and mozzarella bruschetta (v), jd bbq chicken wings. Book online for free text confirmation or call 01332 809 899. Tasty food and a great atmosphere! Well pleased with both service and food. A lovely first anniversary meal. Lovely food, good price. Nice to go mid week for a meal (I suspect Fridays and Saturdays it will be busy as a bar). Fantastic cocktails, great waiter service. The character and atmosphere of the cocktail lounge is popular with guests. The food was good whilst the waitress was very friendly and helpful. Me and my partner enjoyed our food and the whole evening, we will be going back again soon. Was a great meal. Really enjoyed the food. Place is really nice and service was fantastic. Everything was excellent at The Distillery, staff, food and service. We had a very nice experience in The Distillery, food was excellent, whiskey tasting experience absolutely fantastic. The only point that was not perfect is that the waiters forgot my request about the birthday candle, so by the time I reminded it we have finished the meal, and started whiskey tasting, so the cake with the candle arrived in a very strange moment when all of us were busy with the whiskey master. A small thing, but it would have made our evening impeccable. Great food, and fantastic service. Only dropped 1 star as no other diners there - only people drinking. We didnt feel too much out of place. Would go again, but not on a Friday 8pm to eat. 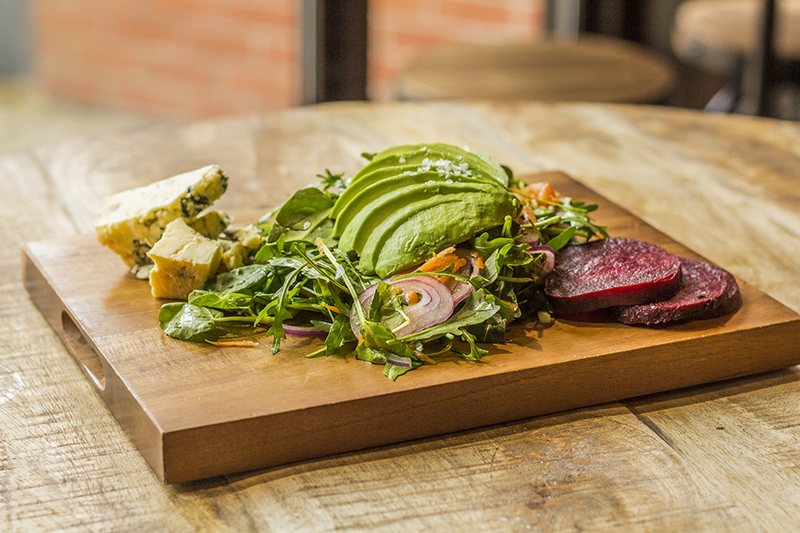 Delicious food at the Distillery with great prices! Very good food and great atmosphere at The Distillery. Service was also great. 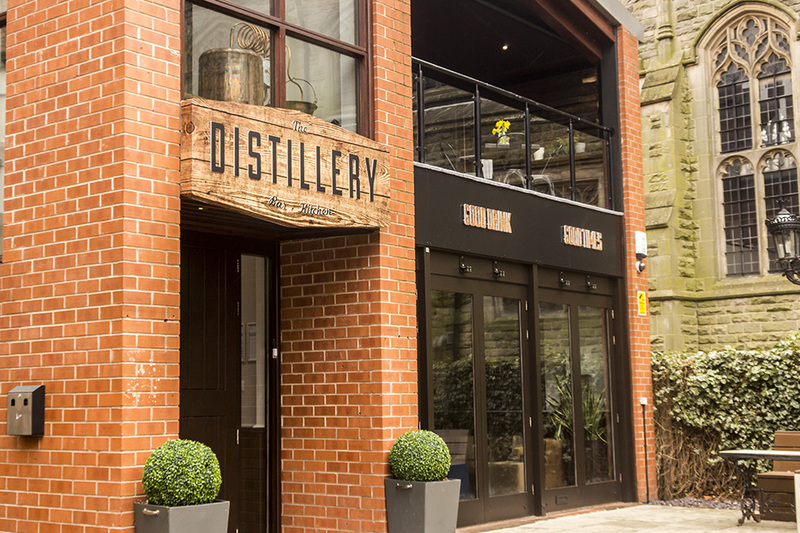 To be discovered at the heart of Derby’s historic Cathedral quarter, The Distillery is an independent eating and drinking establishment with bold ideas. 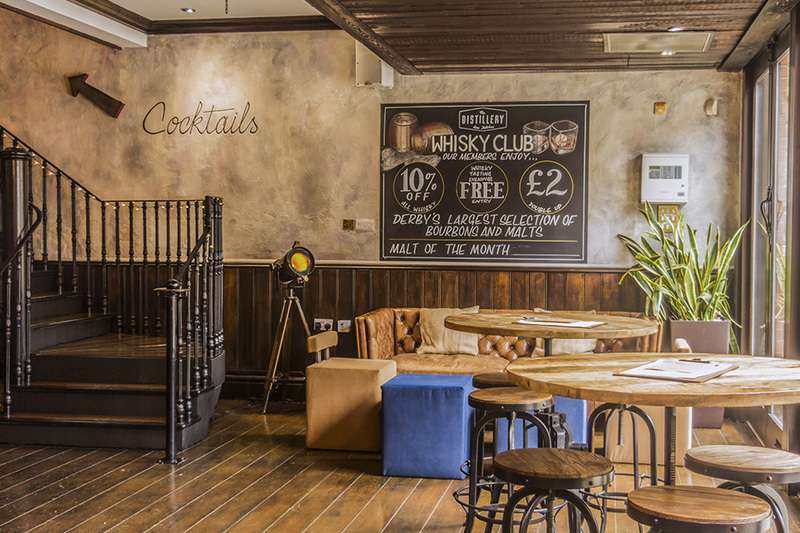 Inspired by the finest whisky distilleries in the world, the team at The Distillery offer a contemporary and innovative menu whilst staying true to traditional values; heritage and quality are at the heart of what they do. Sophisticated in style yet laidback in character, The Distillery invites customers to pass away the hours enjoying its extensive selection of drinks and dishes in plush and enticing surroundings. 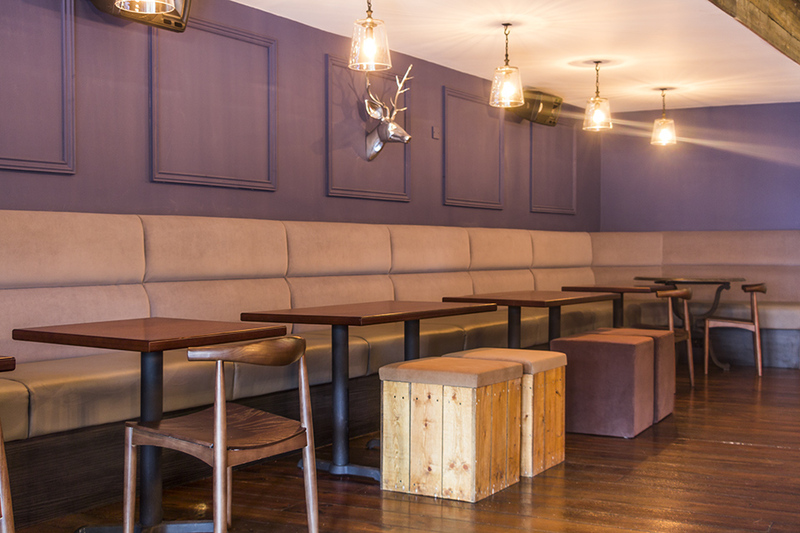 Wood panelled walls and leather sofas are broken up by greenery and artful lighting. 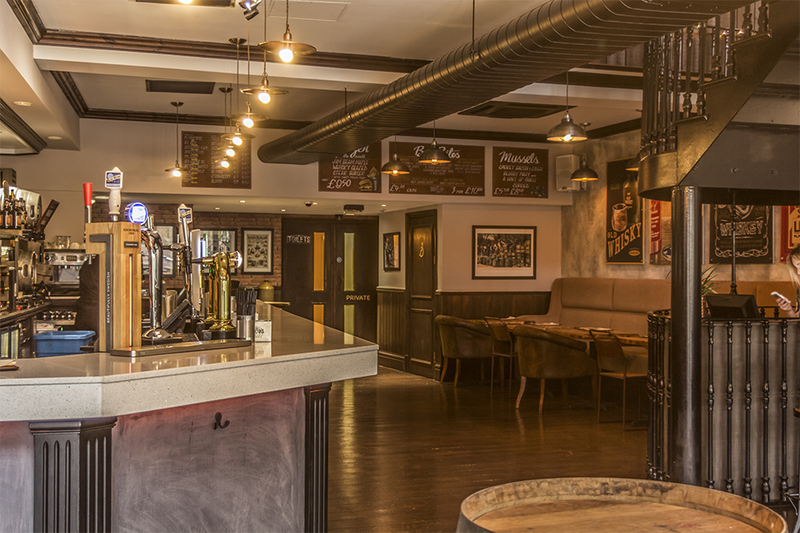 The Distillery kitchen invites you to indulge in its imaginative menu, which you can tailor to whatever sort of dining experience you have in mind. Start as you mean to go on with Caribbean Chilli Prawns (GF) or Courgette and Aubergine Sticks (V), or why not kick things off with a sharing board to accompany those first beverages? The Sharing Platter is hard to resist with Chipolatas, Garlic Mushrooms (V), Tomato and Mozzarella Bruschetta (V) JD BBQ chicken wings. The mains of the menu are suitable sidekicks to the gifts of a distillery. 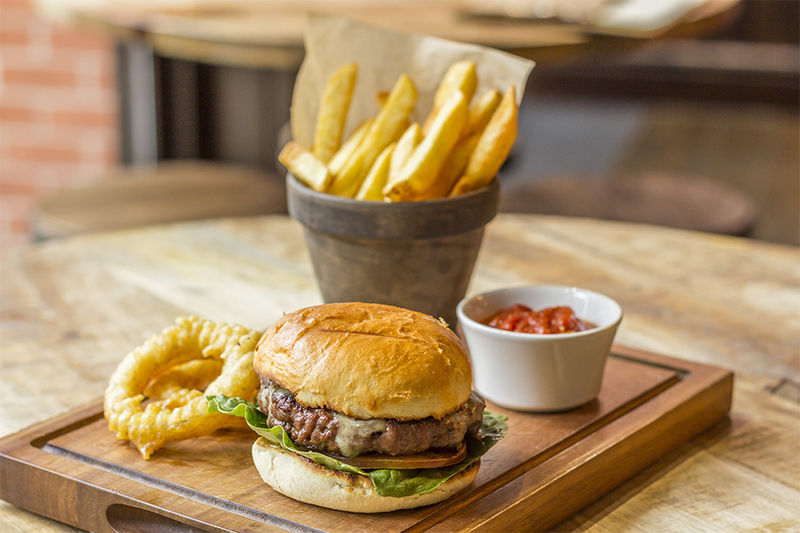 Towering burgers of beef, chicken or zucchini and cheese can be topped with pulled pork, beef brisket or sautéed prawns. Steak fans can choose between a rib eye with all the trimmings or a surf ‘n’ turf sirloin; fish dishes and salads cater for those looking for something lighter. 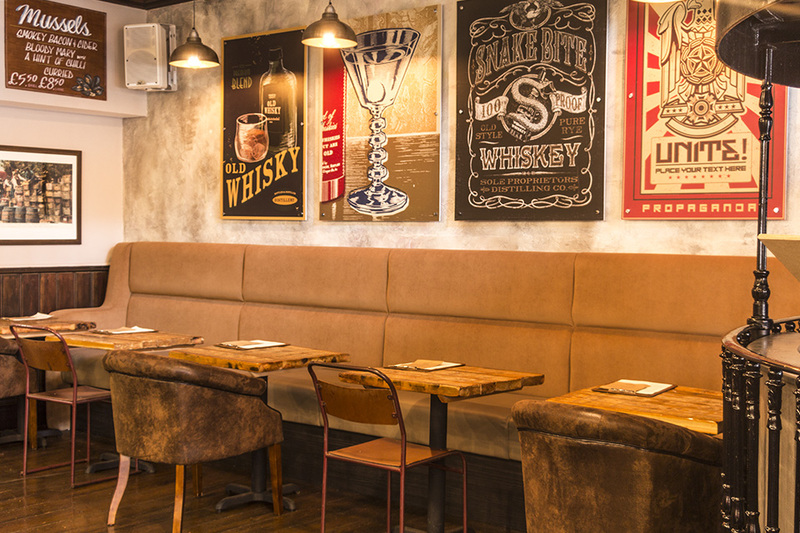 Time is the essence of any distilling process and the ‘Low & Slow menu is the home of dishes with hours of cooking to be savoured in every mouthful, we’d like to sample the Jack Daniels chilli beef brisket. Finally, an evening of indulgence would be incomplete without a dessert and our eyes shot straight to the Bailey’s crème brulée. 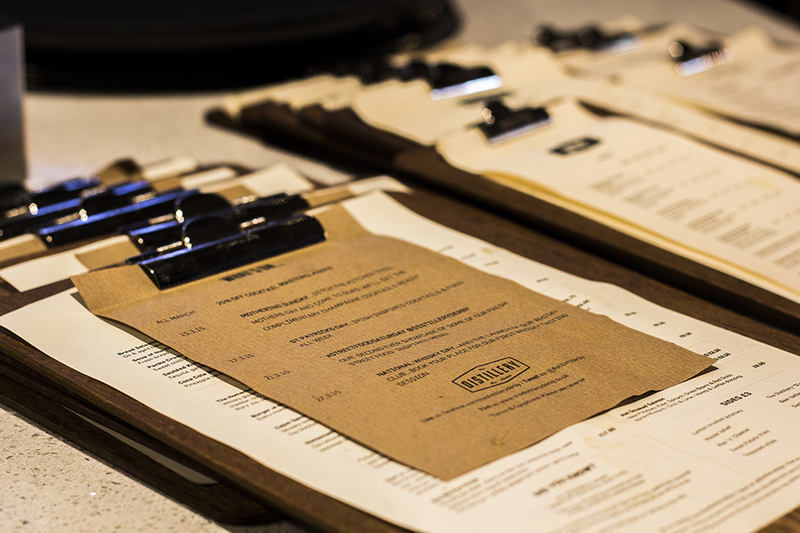 If you’re more of an early riser, why not set yourself up for the day with a brunch at The Distillery? Choose between several options including a traditional full English, bubble & squeak and pancakes with a range of toppings. 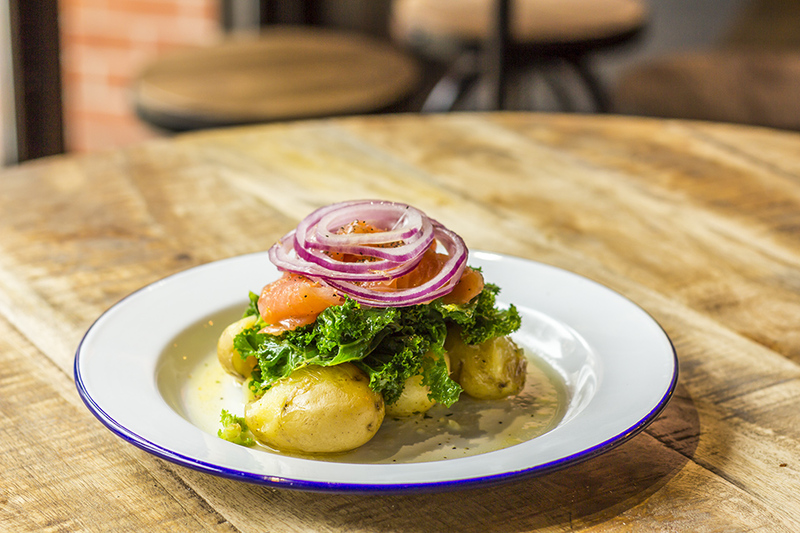 If a mid-day refuel is what you require, the light lunch menu allows you to choose a filling and then vessel; we think a jacket potato loaded with pulled pork and smoked Applewood cheddar would do the job just fine. Offering fuss-free plates in a refined setting, The Distillery serves up hefty dishes with equally bold flavours to match the fruits of its well-stocked bar: the recipe for a successful eating and drinking experience. 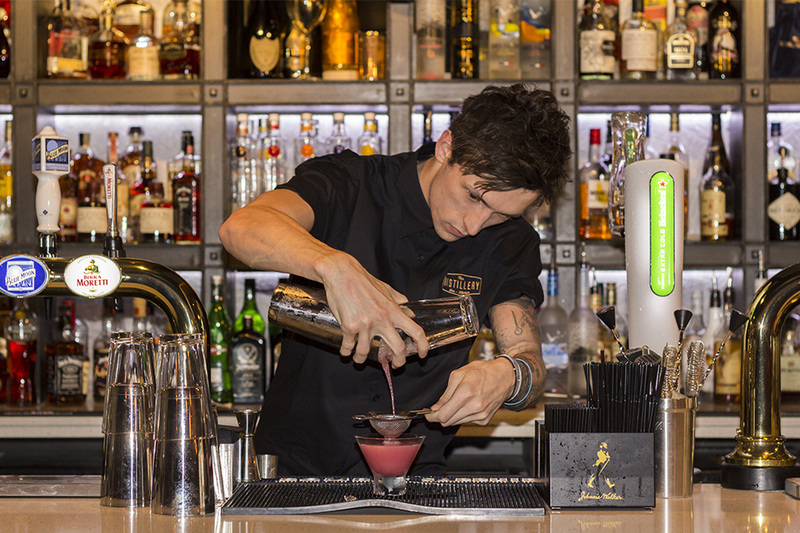 Get your weekend off to a good start with two cocktails for just £10! Available Sunday - Fridays between 5-8pm. Choice available from classic cocktail menu, both cocktails must be the same! Indulge in delicious desserts for just £4.90! Enjoy a delicious sharing platter for just £13! The platter includes Chipolatas, garlic mushrooms (v), tomato and mozzarella bruschetta (v), jd bbq chicken wings.